Bengal Foxes have a body length of approximately 50 cms (20 inches), a tail length between 25 and 30 cms (9.8 - 12 inches) and they weigh between 3 and 4 kgs (6.6 - 8.8 lbs). 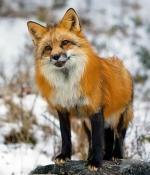 Crab-Eating Foxes have a body length between 60 and 70 cms (24 - 28 inches), a tail length of approximately 30 cms (12 inches) and they weigh 5 - 8 kgs (11 - 18 lbs). 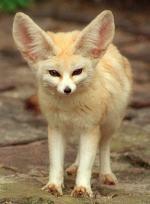 The Fennec Fox is extremely small in size, and it has extremely large ears for such a small animal. The tail is very long too, and it extends the size of about ¾ of the overall body size. The tail has a black tip on it. They have a coat that is soft and ranges in color from a cream to a light orange or brown. They blend into their surroundings well so where they live affects coloring. Hoary Foxes have a body length of approximately 60 cms (23.6 inches), a tail length of approximately 30 cms (11.8 inches), and they weigh between 2.7 and 4 kgs (6 - 8.8 lbs). Pampas Foxes have a body length of approximately 62 cms (24.4 inches), a tail length of approximately 34 cms (13.4 inches), and they weigh between 4 and 6 kgs (8.8 - 13.2 lbs). South American Grey Foxes have a body length between 42 and 68 cms (16.5 - 26.8 inches), a tail length between 30 and 36 cms (12 - 14 inches) and they weigh between 2 and 4 kgs (4.4 - 8.8 lbs). 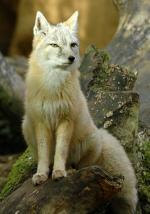 The Swift Fox is a small species and one that is gorgeous to look at. The coloring is a shade of light brown with various colors of orange on it. They also have areas of white and black on their bodies. They can also have patches of light yellow on them. They do have extremely large ears. 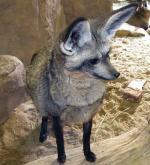 Tibetan Sand Foxes are a very unusual looking species of fox. They have a body length between 50 and 70 cms (19.6 - 27.6 inches), a tail length between 29 and 40 cms (11.4 - 15.7 inches) and they weigh between 3 and 6 kgs (6.6 - 13.2 lbs).